The borage herb is an old fashioned plant that can get up to 2 feet or more. It is native to the Middle East and has an ancient history in war as an enhancement for bravery and courage. Growing borage provides the gardener with cucumber-flavored leaves for tea and other beverages as well as bright starry blue flowers for decorating salads. 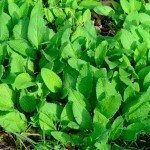 All parts of the plant, except the roots, are flavorful and have culinary or medicinal uses. While not as common as thyme or basil, borage herb (Borago officinalis) is a unique plant for the culinary garden. It grows quickly as an annual but will colonize a corner of the garden by self-seeding and reappearing year after year. 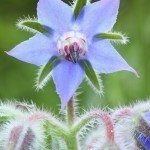 June and July are heralded by the presence of the borage flower, an appealing, small, brilliant blue bloom with attracting qualities. Indeed, the plant should be include in the butterfly garden and brings pollinators to your veggies. The oval leaves are hairy and rough with the lower foliage pushing 6 inches in length. The borage plant may grow 12 or more inches wide in a tall bushy habit. Herb cultivation just takes a little gardening know how. Grow borage in an herb or flower garden. Prepare a garden bed that is well tilled with average organic matter. Ensure that the soil is well drained and in a medium pH range. Sow seeds directly into the garden after the last date of frost. Plant seeds ¼ to ½ inch under the soil in rows 12 inches apart. Thin the borage herb to at least 1 foot when the plants measure 4 to 6 inches tall. Planting borage with strawberries attracts bees and increases the yield of fruit. It has limited culinary use in today’s foods, but the borage flower is often used as a garnish. Traditionally the borage plant was used to treat many ailments, from jaundice to kidney problems. In medicinal use today it is limited, but the seeds are a source of linolenic acid. Borage flowers are also used in potpourris or candied for use in confections. Borage can be perpetuated by allowing the flowers to go to seed and self sow. Pinching the terminal growth will force a bushier plant but may sacrifice some of the flowers. Borage herb is not a fussy plant and has been known to grow in refuse piles and highway ditches. Be assured you want the plant to regrow annually or remove the flowers before it seeds. Growing borage requires a dedicated space in the home garden. Sowing the seeds every four weeks will ensure a ready supply of borage flowers. The leaves may be picked at any time and used fresh. Dried leaves have little of the characteristic flavor so the plant is best consumed after harvest. Leave the flowers alone if you are hosting a honeybee colony. The blooms produce an excellent flavored honey. Read more articles about Borage.